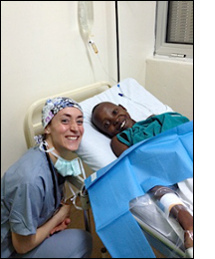 I had the privilege of participating in Team Heart's annual cardiac surgery mission trip to Kigali, Rwanda. Team Heart, a nonprofit organization founded in 2007, works to provide care for patients suffering from rheumatic heart disease and to educate community providers to recognize signs and symptoms of rheumatic fever at earlier stages. Our work as anesthesiologists focused mostly on the surgical care of rheumatic heart patients with stage III and IV heart failure. In total, we performed seventeen open heart cardiac bypass cases with mechanical valves. Even though King Faisal Hospital in Kigali is considered the "premier" hospital in Rwanda, it was shocking how few resources were there and how little formal training many of the medical and nursing staff have had. While providing care for extremely sick patients was the focus of our trip, Team Heart continues its ongoing mission to help develop a self-sustaining cardiac surgical program in Rwanda. Currently, there is no cardiac surgery team present in the entire country, and any Rwandans requiring cardiac surgical care must either wait for an international mission team like ours or receive funding to travel to a foreign country for care. The Rwandan providers worked with our team as nurses, perfusionists, cardiologists, and anesthesiologists; a Rwandan anesthesiologist operated as the primary provider under our supervision for several cases. While Rwanda is still several years away from being able to perform these surgeries independently, observing the strides made by the Rwandan providers in the time we were there was inspiring.